Palos Verdes is a name often used to refer to a group of coastal cities on the Palos Verdes Peninsula in southwestern Los Angeles County in California. Palos Verdes Estates, Rancho Palos Verdes, Rolling Hills, and Rolling Hills Estates are the predominant cities in the area. This affluent bedroom community is known for its dramatic views, great schools, extensive horse trails, and tranquil living while still being in Los Angeles. PalosVerdesLifestyle – Norma’s award winning Palos Verdes real estate blog with archives back to 2007. The Palos Verdes Unified School District – PV’s public school system. 1. The Coastal Location: I have a need to be close to the ocean. A long walk along a beach is one of my favorite indulgences, and I partake often. It’s a quality of life decision for me. It’s also called location. 2. The Outstanding School District: Hands down this is why I moved to Palos Verdes 19 years ago. It remains the main draw for many new residents. 3. The Country Setting in an Urban County: Los Angeles is one of the most densely populated counties in the country, but upon entering Palos Verdes you are immediately struck by the open space. 4. The Breathtaking Views: You do not have to own a view property to enjoy the spectacular vistas. A drive around the Palos Verdes Peninsula offers views of Catalina Island, a couple of lighthouses, sweeping coastline views, Los Angeles Harbor views, and dazzling city lights views. 5. The Low Profile Attitude: This is not Hollywood or even Beverly Hills. It’s quiet here. There are four cities in Palos Verdes plus a section of unincorporated county land. Palos Verdes is a name often used to refer to a group of coastal cities on the Palos Verdes Peninsula in southwestern Los Angeles County in California. Palos Verdes Estates, Rancho Palos Verdes, Rolling Hills, and Rolling Hills Estates are the predominant cities in the area. This affluent bedroom community is known for its dramatic views, great schools, and extensive horse trails. The peninsula was originally inhabited by Native Americans belonging to the Tongva (sometimes referred to as “Gabrielino”) tribe, and first described in 1542 by Portuguese explorer Juan Cabrillo. In 1827, Jose Dolores Sepulveda procured a parcel of the original, 1784 Rancho San Pedro Spanish land grant from Manuel Dominguez, and named it Rancho de los Palos Verdes (“range of green trees”), which was used primarily as a cattle ranch. By 1882 ownership of the land had passed from the Sepulveda through various mortgage holders to Jotham Bixby of Rancho Los Cerritos, who leased the land to Japanese farmers. After the turn of the century most of Bixby’s land was sold to a consortium of New York investors who created The Palos Verdes Project and began marketing land on the peninsula for small horse ranches and residential communities. Palos Verdes Estates was the first city incorporated on the Peninsula and was one of the first master planned communities in Los Angeles County. The other incorporated cities on the Palos Verdes Peninsula include Rancho Palos Verdes, Rolling Hills Estates and Rolling Hills. Practically the entire commercial district is in Rolling Hills Estates. There are many shopping centers there, including The Promenade of the Peninsula. This outdoor mall includes a megaplex movie theater, many eateries, and an ice rink. 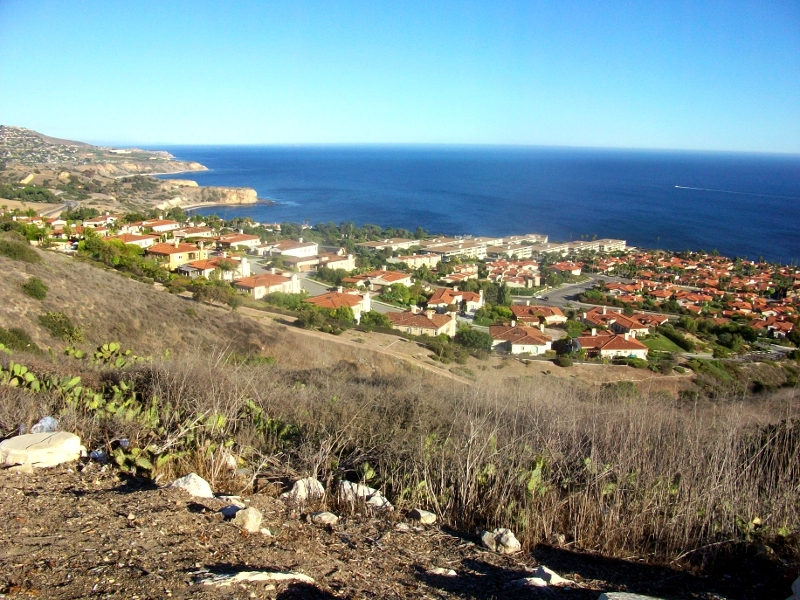 Areas of commerce include “The Promenade” mall, Malaga Cove, and Lunada Bay. Lesser known shopping centers include the Peninsula Center, Town and Country, and The Village. The area where Marineland of the Pacific once stood now serves as an outdoor set for commercials, film productions, and, in 1996, the MTV Beach House. 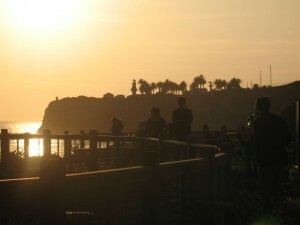 Fox filmed some scenes of its teen drama, The OC, at locations in and around Palos Verdes. Donald Trump’s latest venture is Trump National a golf course on the Ocean Trails cliffs. The Palos Verdes Peninsula Unified School District has one of the highest rated API scores in California, and has one of the highest average SAT scores and one of the highest percentage of students successfully completing the Advanced Placement exams in the county. There are three high schools, Palos Verdes Peninsula High School (formerly called Rolling Hills High School), Palos Verdes High School (the latter located just a half block from the Pacific Ocean), and Rancho Del Mar High School (located in Rolling Hills). Marymount College, a co-ed Roman Catholic two-year college is located in Rancho Palos Verdes. A private K-12 school, Chadwick School, is also located there. Rolling Hills Preparatory School, a private 6-12 school is also located on the peninsula. Rolling Hills Country Day School, adjacent to the Botanic Garden, offers a private K-8 education . The Peninsula is served by the Palos Verdes Library District which operates the Peninsula Center, Miraleste, and Malaga Cove Libraries. The area is frequented by runners, hikers, horseback riders, bird watchers, surfers, scuba divers, and bicyclists. The area is home to several golf courses and country clubs. Some information from the 2009 Wikipedia. GNU Free Documentation License.